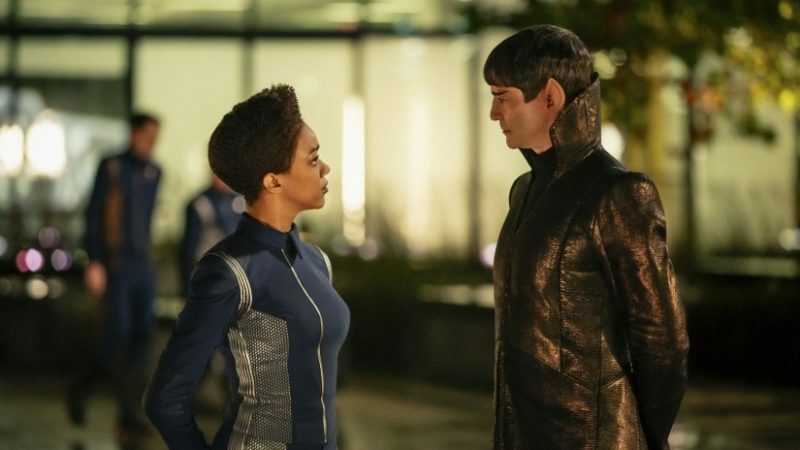 "The season ends with an interesting promise for season two"
There was a lot to grumble (or, in some cases, shout in anger) about in season one of CBS All-Access's Star Trek: Discovery. Looking back at the the ups and downs, it's hard for me to recommend that someone shell out the money for the All-Access streaming service just to watch the series. While I'm still disappointed at how the show relied too much on twists and turns to create a story rather than using its accomplished cast and surprisingly well-developed characters to drive the plot, the season's final two episodes showed just how good the show can truly be. And, while I'm a bit worried by the writers' latest attempt to use a "twist" to push the story forward into season two, I have hope that with the characters in place, things will be more even and run smoother during the show's sophomore outing. Now, onto the spoilers. "Will You Take My Hand?" was successful on a number of levels. In terms of standalone plot, it was fun (Mary Wiseman's Tilly has really turned into a hell of a character, thanks in great part to Wiseman's excellent work) while continuing to maintain the tension of the situation (waiting for Georgiou's inevitable betrayal was an exercise in patience, but the payoff was sound and made sense for the character), moving the plot forward to wrap up the season-long arc with the Klingons. 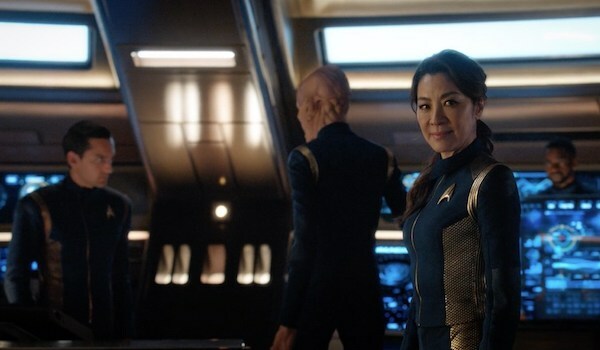 In terms of setting the table for season two, the episode cleaned out the cast of its remaining dead weight (no disrespect to Shazar Latiff, but Tyler had to go), while keeping Georgiou as a possible character for down the line (perhaps the best move of the episode, as I firmly believe the Star Trek world is a better place with Michelle Yeoh out there on the bench for some killer arc in the future). I'm less thrilled at the prospect of getting an Enterprise story to kick off season two, as I would really like to see the series stand on its own for a full season without relying on nostalgia/other Trek characters in an attempt pull in additional eyeballs at the expense of additional world building, but I'll reserve judgment until I see exactly what this story will become. But, all-in-all, a solid hour of television that kept me interested from the word go, which hasn't been the case with most episode throughout the season. The episode's heavy lifting was done well- wrapping up the Klingon conflict by letting L'Rell take over the reunification of the Klingon Empire was smart, and helps excuse the insane amount of time spent fleshing the character out prior to shoving her into the corner late in the season. Having Tyler opt to work alongside L'Rell in her efforts allows the show to wash its hands of a character that had no upside to the future story of the series (and whose presence would only serve to weigh down the plot and potentially anger audience members when his eventual redemption arc began). Both characters, like Georgiou, are still out there in the universe, so they could pop up as needed, but it's perhaps better if this is the last we see of either (hell, I'd be thrilled if we never saw another Klingon again). And Burnham's reinstatement in Starfleet (which was the only path for the show to take) was handled as well as it could be (that speech at the end, while meant to be inspiring, was way too schmaltzy and just not necessary). For season two, my major hope is that the series continues to use its characters to push the story, rather than simply have them react to twists and turns that don't feel earned. The appearance of the Enterprise and Captain Pike in the finale seems to hint that the writers still don't trust the show to stand on its own, which is troubling. The best cast scenario is that this appearance simply serves as a jumping off point for a larger arc, rather than the show throwing another familiar face from the past into the mix to help make the series more palatable to some people (the appearances of Harvey Mudd this season were fine, and the second episode was a highlight, but we don't need faces from the Original Series to prop up the series). I also hope against hope that the writers will own their past mistakes (letting the Lorca arc drag out for so long, pulling the rug out from under Ash Tyler, killing Culber in a blatant instance of the Kill Your Gays trope) and take steps to avoid them in the future. The hard work has been done- this particular universe is laid out, the remaining characters are interesting and well-written, and the actors know what they're doing. There's a good show here. Trust in the work that has been done and let it play out amongst the stars.